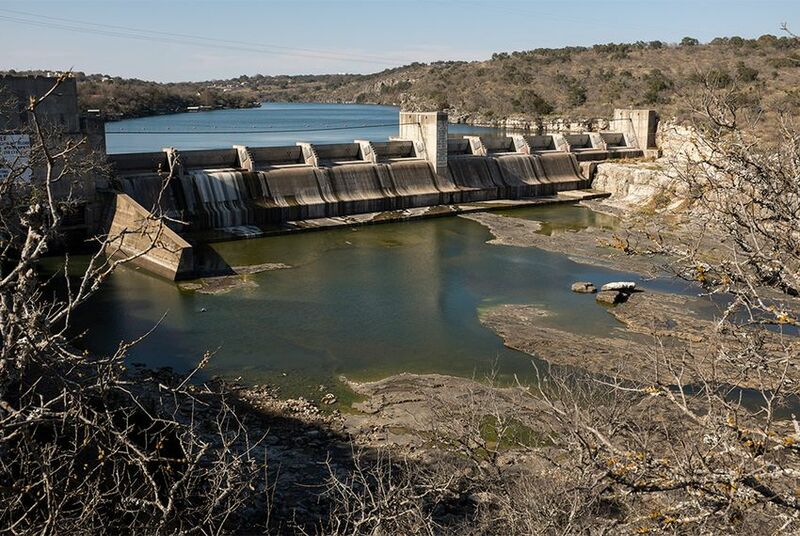 The ongoing drought in Central Texas is claiming an innocent bystander: hydroelectricity. As the Lower Colorado River Authority limits water releases downstream, hydroelectricity — a power source that spurred the LCRA's creation almost 80 years ago — has faded further into obscurity. Central Texas’ yearslong drought could eventually snuff out a renewable power source that fueled its early growth: hydropower. Faced with dwindling water supplies, the Lower Colorado River Authority, which supplies water and energy to much of Central Texas, is limiting downstream water releases for activities like rice farming. Aside from stirring controversy among water users, the changes have also shrunk the amount of electricity the agency generates from its six Colorado River dams. “Your hydropower becomes an innocent bystander of the conditions around it,” said Robert Cullick, a former LCRA spokesman who is now a consultant. Hydroelectricity makes up a sliver of LCRA's energy portfolio, a mix of coal, natural gas and wind energy, and its further decline would probably not impact the region’s energy reliability. But its possible extinction would close the book on a fuel source that played a major role in the history of Central Texas and the creation of the LCRA, whose dams make up about 40 percent of the state’s hydropower capacity. “Certainly, the history of the LCRA is all wrapped up in hydroelectricity generation,” said Michael Webber, deputy director of the Energy Institute at the University of Texas at Austin. In the early 1930s, Texas lawmakers sought federal funds to dam the Colorado River to prevent flooding and shore up the region’s water supply. Because that funding could only go to a public agency, they created the LCRA and agreed to pay off the federal loan with revenue from hydropower sales. Until the mid-1960s, the agency generated most of its electricity from its Colorado River dams, before the region’s growth outpaced the generators’ capacity, forcing the LCRA to build other power plants, and hydropower faded in importance. Now, hydropower makes up less than 6 percent of the agency’s total energy capacity, and water managers rarely use the generators to their full potential. In recent decades, they have only run the generators when releasing water downstream for other purposes. LCRA's more recent curbs on downstream releases has sped hydropower’s decline. The agency now generates just about a third of the hydropower it did in 2011, the last year that most rice farmers received Colorado River water. If the drought persists, said Ryan Rowney, executive manager of water operations at the LCRA, water levels could “within several years” plummet below levels needed to turn the agency’s hydropower generators. “We have models and things, but we don’t truly know how quickly the lakes will fall,” Rowney said. As a low-cost, no-pollution energy source that can be quickly turned on and off, hydroelectricity is a coveted power source, said Webber, but it’s a “pretty limited option” for Texas, whose geography and climate are ill-suited for it. And since the state long ago dammed up its best rivers, it is unlikely to grow much — if at all — in the future.